I love the simple posts on the blog, Jungle Jot, presented by an "accidental missionary" in the Philippines. Here, an enticing bit about a seemingly magical motorcycle. Feel free to theorize on the source of the renewed beard. 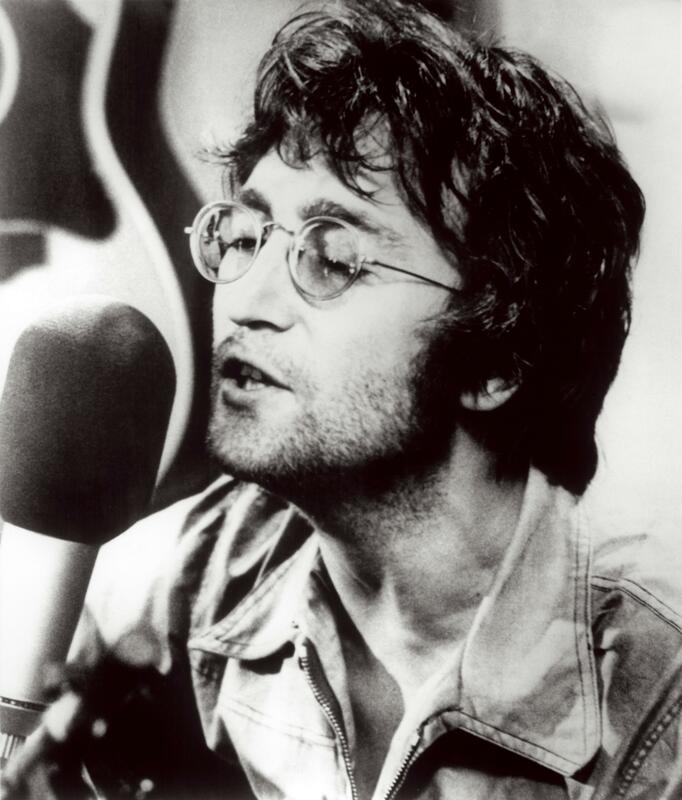 "I'm so lonely, wanna die..."
Remembering John Lennon on what would have been his seventy-fourth birthday. The lyrics above are what I automatically, first-reflex think of when I think of Lennon. I don't know why. The song? Yer Blues. According to Lennon's famous 1970 interview with Rolling Stone founder Jann Wenner, the rest of the Beatles told Lennon that the name of the song should be My Blues, to be honest. But he couldn't quite admit to being "blue" so publicly, he said. I'm more than blue that John Lennon was killed at the age of forty and that he apparently never got to know Jesus Christ. Pray for the artists whose work touches you, Christians and not. Fame is a corrupting state of being that can destroy a person's soul. So, pray for those who have been gifted by God with the ability to create and perform music--hip hoppers, rockers, country crooners, techno poppers, dubbers, whatever. You may never meet them; but you could change their lives (and their art) for eternity by lifting them up to the throne of God. Jesus doesn't promise that we'll be happy when we follow Him. He doesn't even promise that, despite the fact that God never leaves us alone, we won't sometimes feel lonely. (Also here.) We most certainly will. Jesus isn't some motivational speaker or religious guru. He's God in the flesh. He died to overcome our unhappiness and our loneliness, along with our sin, death, and darkness. For now, we hobble on with no promise of an easy way (or, as the apostle Paul put it, we see through a glass darkly or a mirror dimly), but we hobble and we see vaguely with the joy of knowing that as long as we keep following Christ, we're never alone and that we have access to the "peace that transcends all understanding." That can be a hard pill to swallow. If you're looking for easy answers, don't look for them in the Christian faith. But if you're looking for real answers from the real God Who has experienced and overcome all we deal with in the real world, check out Jesus Christ. Although the little story at the beginning of today's installment of Our Daily Bread seems trite and unnecessary, the point is a good one. Our prayers often revolve around asking God to hurry up and bless what we want to do. What if God’s answer to us is simply, “Be patient. Wait upon Me”? We can pray with David: “Listen to my voice in the morning, Lord. Each morning I bring my requests to you and wait expectantly” (Psalm 5:3). Patience in prayer is difficult. (Really, patience in anything is difficult, isn't it?) And no matter how many times I have seen God work in me and in circumstances for which I've prayed for long periods of time, I still find patience in prayer difficult. God seems to need to teach me the same lessons repeatedly, including this one about waiting for Him and His timing and His will. Thankfully, He's more patient than I am! In his book on prayer, Ole Hallesby gives great advice on the first question. If we're uncertain about the advisability of the thing for which we're praying, we should own our uncertainty and just tell God, in our own words and from the heart, "Grant this request only if it will bring You glory." God isn't a Ouija board we manipulate to get to where we want to go. He's not an ATM. To pray to the God we know in Jesus Christ is to submit to His will. But there is nothing wrong with asking...ever. When I pray in this way, I also ask God to demonstrate so clearly that, if He is saying no to my request, even I can understand that I need to stop bringing that prayer to Him. Until I have that clear sense, I don't stop praying. In Luke 18:1-8, Jesus tells a parable, the purpose of which was, Luke says, to tell His followers, "...that they should always pray and not give up." When I pair this persistence in prayer with a persistent desire that God only answer the prayer positively if it will bring Him glory, I feel that I have God's permission to keep on praying. This was the opening song of Steve Taylor's concert in Columbus on May 1. I was able to enjoy seeing my favorite Christian artist for the first time ever with great friends from Logan on that night! I'm thankful that someone caught his performance on video. The song is on Taylor's newest LP. The classic hymn, We Give Thee But Thine Own. Some of you may have been trustees of the estates of loved ones or friends. You know that your responsibility is to see to it that the estate is cared for or distributed with wisdom and in accordance with the wishes of the one who conferred the responsibility of trusteeship on you. It’s a big job, not to be taken lightly. In this passage, the apostle Paul wrote to show that his ministry was from the risen Jesus Christ. Christ had conferred it upon him. But in writing this, Paul also taught an important truth for every baptized believer in the God revealed in Jesus Christ. It’s this: All believers are caretakers, stewards, trustees of the mysterious gifts God gives to all who trust in Christ. We’re to tend the gift of faith within us--through things like worship, Bible study, receiving the Sacrament, fellowship with other believers, and prayer--so that our faith continues to grow and continues show and to bring glory to God in lives of practical acts of service and love and witness for Christ. Without careful stewardship of the mysteries of our relationship with Christ, Christians risk losing our own faith connection to God and fail to fulfill our life’s calling from God, which is to commend the hope that we have in Christ to other people. When Paul wrote these words to the Corinthians about twenty years after the death and resurrection of Jesus, he wasn’t presenting a new idea. It’s an idea that goes all the way back to the garden of Eden, the home of the first human beings. Adam and Eve were given the undeserved gifts of life, relationship with God, and relationship with each other, the very gifts we receive when we are baptized into Christ and confess faith in Him. Adam’s and Eve’s task was to gratefully tend their garden, their lives, and their relationships. You’ll remember how that all turned out. But God didn’t give up on the human race after the fall into sin! Nor did He ever give up on the idea of having a loving partnership with us, of providing us with a “garden” or a "vineyard" in which, in response to His grace and love, we were to be good stewards of life and our relationships with God and others we were made for. God’s passion for the human race led Him to call Israel into being, a nation that was to be “a royal priesthood, God’s own people, a holy nation,” trustees of God’s love for humanity, who by their faithful stewardship would act as “a light to the nations,” so everyone could know and have a new, eternal relationship with the God of the universe. All of which leads us to today’s gospel lesson, Matthew 21:33-46, page 691 in the sanctuary Bibles. This passage continues a confrontation between Jesus and the leaders of the Jewish faith that we looked at last Sunday. In last Sunday’s lesson, Jesus made clear that His authority to forgive sin, perform miracles, and call His own people, the heirs of ancient Israel, to repentance and faith in Him came from God the Father. Today, Jesus talks about how essential it is to receive Him God and Savior of the world. Their “vineyard,” their very lives, were to bear fruit: the power of God’s life, as they cultivated relationship with God, was to be visible in their lives, not in some calculated way but as the inevitable result of living in a relationship of daily repentance and renewal with God. In the parable, the landowner--clearly a stand-in for God--who has invested everything in the lives of the tenants, sends his servants--representing God’s prophets--to collect the owner’s cut of the fruits, just as the prophets were repeatedly sent to Israel by God to seek out the fruits of faith and repentance--lives turned to God as their only hope--as freewill offerings to God. The tenants--God’s own people--were indebted to the landowner--God--for everything. God sent His prophets. But the people, the caretakers of God’s mysteries, turned their backs on God and, in a bid to “be like God,” killed the prophets, imprisoned them, ignored them. Jesus lamented in Matthew 23:27: “Jerusalem, Jerusalem, you who kill the prophets and stone those sent to you, how often I have longed to gather your children together, as a hen gathers her chicks under her wings, and you were not willing.” I wonder how often He utters the same lament over His Church today? True story: There were two men who went to the same church, participated in the same small group Bible study, and worked at the same business. One guy learned that his Christian friend had found a way to siphon money from accounts he had charge of. But, the monthly accounts hadn’t been settled yet. So, the guy went to his friend, confronted him with the facts, and asked him to make things right so that he wouldn’t have to report his friend. He assured the friend that God could forgive him. But his friend was unmoved: “What’s God got to do with it? This is business.” Initially, like the tenants in Jesus’ parable, this man refused God’s authority over his whole life. Happily, after prayer with his friend, he repented and didn’t follow through on his scheme. For the Christian, all of life is God’s vineyard, a gift from God. That's to be remembered and relished and celebrated not just on Sunday mornings or when Bible studies are happening, but all week long. After centuries in which God sent prophets to call His people Israel back to Him, He sent His Son to call not just Israel but all who would believe in Him back into relationship with Him, so that through faith in the crucified and risen Jesus, people could have a life with God that never ends. But much of Israel--the Judea of Jesus’ first century world--wasn’t interested in repenting for sin and believing in Christ as “the way, the truth, and the life.” Like us, they wanted to do with God’s vineyard what they wanted to do. Today, people say that their lives and their bodies and their time are theirs to do with what they will. But that isn’t true. Our lives (and our bodies and our time) have come from God. Jesus Christ spent His body and blood on the cross to buy us out of slavery to sin and death. As Christians, we know that our lives are not our own. Our lives, our bodies, our minds, our time, our possessions are all sacred trusts from God to be used in ways that honor the Lordship of Jesus Christ and lift Him up as the only hope for this dying, violent world. Jesus’ parable makes it clear, I think, that the religious leaders weren’t ignorant of Who Jesus was. They knew that He was (and is) God the Son. That’s why they wanted to remove Him from this world. It’s why people to this day want to remove Jesus and His claims of ultimate authority from the life of the world. It’s why when any of us allow our sinful selves to call the shots over our lives, we’d rather not think about Jesus. We know we’ve been bought; but we’d rather forget that. You and I are more subtle about deflecting Christ and His rightful claims over our lives than the first-century Judean religious leaders were. Our favorite method of deflection is through busy-ness. We respond to the clamor of things we think we have to do and want to do, rather than the things we need to do. We’re modern day Marthas, so busy doing that we fail to heed the one thing that’s needful, tending our relationship with Jesus Christ, being attentive to Him. Jesus was telling the leaders that they were so hung up on maintaining their status--and the whole human race remains hung up on having what we think is ours when, in fact, every good and perfect gift comes from God--that their very salvation was going to be taken from them. The world--even the Church of today--is complacent. We’re running the vineyard and we don’t want to cede control to God. We want to be in control. Besides, we tell ourselves, Jesus walked the earth so long ago. And it’s been so long since He rose from the dead and ascended to heaven. But we must not be complacent! Nor egotistical! Our lives can come to an end in a flash and the course of our time on this earth can change more quickly than we can fathom. When I woke up on one June morning in 2014, I had no idea that later that night, I would have a heart attack that would destroy 40% of my heart, that I would require not just a stent, but also a pacemaker and defibrillator. When I get out of the shower each morning and catch sight of the outlines of this machine in my chest, I remember that I'm just a tenant, that real life doesn't issue from being in control here, but in giving control to the One Who still has the whole world in His hands. We must remember always that real hope comes from Jesus Christ alone. This vineyard will one day pass from existence and Christ will establish His new kingdom for eternity and those who have steadfastly followed Him will, by His grace, be part of it. Jesus Christ is the sign and seal that God and His promises can be trusted. And that this world is still His vineyard. We are still His tenants.